Franklin Chang-Diaz (also known as Franklin Chang) was born in Costa Rica to a Chinese father and a Latino mother. As a youngster, he watched the stars from his roof with his little sister, and told his parents he was going to be an astronaut. Believing that the road to outer space went through the U.S., he left Costa Rica as a teenager, and went to the U.S. with $75. He lived with relatives, and attended an American high school. A serious and ambitious student, he wore a jacket and tie to school. He received a scholarship to the University of Connecticut, then earned a doctorate at MIT, doing research in plasma-based rockets. When NASA was looking for astronauts, he applied and was accepted. He called his parents, and told them that his childhood dream had been fulfilled; he was going into space. Eventually he was on seven space missions — more than any other astronaut. When he retired from NASA, Chang-Diaz started Ad Astra Rocket Company, which is developing plasma-based rockets. These rockets travel faster than today’s rockets, and may enable manned flight to Mars, etc. We’ve all heard that there are three kinds of matter — solids, liquids, and gases. Chang-Diaz adds a fourth: plasma. Plasma is the most common form of matter in the universe; stars consist of plasma. Plasma results from heating atoms to the point where their electrons break out of their usual shells, and go haywire. Higher temperatures and energy levels translate into higher rocket speeds. Where will Chang-Diaz’s rockets get all this energy from? It all starts with nuclear power, which generates electricity, which is used to heat atoms to very high temperatures. Like an electric power plant, the rocket uses magnets to generate energy. Chang-Diaz’s rockets are scheduled to be tested in a couple years on a short flight to the International Space Station. In Costa Rica, Chang-Diaz is a national hero. In science, those who make revolutionary discoveries are often people who don’t specialize in the field that they revolutionize. Dalton, for example, who revolutionized chemistry, didn’t specialize in chemistry; Dalton revolutionized chemistry by applying to chemistry insights that he had acquired from meteorology and physics. The problem that Bessemer was trying to solve was how to make steel that wasn’t as brittle as cast iron, nor as labor-intensive as wrought iron. Cast iron was brittle because it had a high carbon content; wrought iron was labor-intensive because removing carbon was tedious. Bessemer’s invention was a “blast furnace” that blasted air through molten iron, removing just the right amount of carbon, with little labor. B. Asimov says that, 80 million years ago, ocean temperatures averaged 70º F, and then they declined gradually to their present level of 35º F.2 This dramatic cooling of the oceans may have contributed to the extinction of the dinosaurs, who were suited to a warmer world. During its 4.5 billion years of existence, the earth has experienced dramatic temperature changes, and there’s every reason to believe that significant temperature changes will occur in the future — with or without human interference. These changes will make some latitudes and altitudes uninhabitable, while making others more habitable; some species will benefit, others will suffer. C. In the late 1800s, the first subatomic particle was discovered: the electron. Next came the proton. With the discovery of the neutron, simplicity was lost. My theory of history has a certain simplicity. According to my theory, societies have life- and death-instincts; renaissance and decadence are manifestations of these instincts. Life and death and nothing more. D. An electron has a negative charge; a proton, a positive charge. But what exactly is a “charge”? Asimov says, “we know what [a charge] does and how to measure its properties, but we do not know what it is.”4 In my book of aphorisms, I wrote, “Newton was content to state the laws of gravity though he was ignorant of what gravity actually was, just as quantum physics doesn’t know what a quantum actually is.” My theory of history is about the life- and death-instincts, but I don’t know what those instincts actually are. E. Early scientists dealt with the periphery of the atom — giving or receiving electrons. Later scientists penetrated into the nucleus of the atom — nuclear fission, fusion, etc. Likewise, early novelists like Fielding and Scott dealt with the outer world, while later novelists, like Proust and Kafka, depicted the mind itself — how the mind bends the external world. Discussing the history of radio, Asimov says that the physicist Oliver Joseph Lodge “later gained a dubious kind of fame as a champion of spiritualism.”7 To call such fame “dubious” is to overlook the fact that one of the leading philosophers of the time, William James, had a keen interest in the occult, as did one of the leading poets of the time, W. B. Yeats, and one of the leading psychologists of the time, C. G. Jung — not to mention the wealth of evidence in support of this viewpoint, evidence that Asimov chooses to ignore. G. Asimov insists that nuclear power can be constructive as well as destructive. Nuclear power shouldn’t cause us to take a negative view of science in general — something that Americans are apt to do, with their “rather strong Rousseauan tradition against book learning as a corrupter of the simple integrity of human beings in a state of nature.”8 Has Asimov captured, in this sentence, the essence of Richard Hofstadter’s book, Anti-intellectualism in American Life? In an earlier issue, I said that, in the U.S., more and more children were contracting cancer, and the cause was unknown. Asimov discusses possible causes of cancer, such as radioactive isotopes like Carbon-14 and Strontium-90, both of which can be found in the human body. Carbon-14 occurs naturally; it is part of the “background radiation” that has existed longer than the human race. The presence of Carbon-14 in genes could cause genetic mutations, and perhaps cancer. After reading such things, one must question the wisdom of nuclear tests, such as the tests made in the 1950s of hydrogen bombs. After an American test in 1954 in the Pacific, “Seven thousand square miles were seriously contaminated — an area nearly the size of Massachusetts.”10 The fallout from such bombs spreads over half the world. In my view, George Kennan is one of the most persuasive of those who have argued that the U.S. should have been less competitive in its nuclear arms race with the Soviets. My wife and I visited two Chinese practitioners of Chinese medicine: Dr. Zhao Mei of Portland, Maine, and Dr. Guangli Xu of Brookline, Massachusetts.11 Dr. Mei has acquired a reputation, in the Portland area, for helping cancer patients. She was trained in Western medicine in China, then learned about the Chinese approach to qi from a qi master whom she met in the countryside, during the Cultural Revolution. She uses vigorous massage to get the qi moving properly. She has good intuition about health — overall health. A Portland chiropractor, Robert Deutsch, performs the same test with bottles of medicine. He asks you to hold each of your bottles in turn, tests whether you can stand firm under pressure, then says “you stood firm while holding this bottle, so this medicine is good for you.” Perhaps chiropractors have a less rational-scientific approach to medicine, a more “alternative” approach, than other doctors. When Dr. Mei told Yafei to soak her feet, Yafei said she had an electric soak-and-massage device. Dr. Mei said, don’t use it; she seemed to think that electric devices, like cell phones, have negative qi. Is this an argument for a simple, old-fashioned, un-electrified lifestyle, such as the Amish lead? I asked Dr. Mei, what is qi? She said qi is the invisible part of a person. She said that she had developed her qi for years, and now possessed strong qi. She said that qi can be transferred to an object, such as a comb or a coin; she said that such qi-filled objects are sometimes sold. While Western medicine seeks a cause of cancer in genes, in something tangible, Dr. Mei seeks a cause of cancer in stress and sorrow, in something intangible. She told us that one of her cancer patients had a child who changed his gender. The patient didn’t tell anyone about this gender-change, and the emotional burden of this secret led to cancer (in Dr. Mei’s view). I was impressed with Dr. Mei, but Yafei didn’t feel better after the massage, so we sought a less-distant practitioner of Chinese medicine, and found Dr. Xu in Brookline. He uses Chinese herbs and acupuncture. A. I recently sold some books through Amazon (the new version of my book of aphorisms). To print more copies, I use a printer called Lightning Source, who specializes in print-on-demand. Another printer who serves the self-publishing market is Lulu. Lulu will even help you with cover design. One might describe Lulu as a vanity press for the digital age. If you don’t want to print small batches, if you want to print, say, 500 copies, consider Morris Publishing. B. In recent weeks, I approached a few publishers and literary agents about Realms of Gold: A Sketch of Western Literature. I only wanted to approach a few because I knew it was a hopeless endeavor, and I didn’t want it to be endless as well as hopeless. The chances of interesting a publisher in a non-fiction literary work are so slim that it might be wise not even to try — just go straight to web-publishing or self-publishing. Or shout from a rooftop, or from a Hyde Park soap-box. Now I’m moving forward with a self-publishing project, hoping that one of my two books will gain some sales momentum, and help the other one. I discussed the Chinese health care system with a friend from China. Unlike the American system, the Chinese system doesn’t allow poor people to present themselves at an Emergency Room, and receive care. If they can find a government clinic, poor people might receive some care, but only a limited amount. Unlike an American hospital, a Chinese hospital might allow a poor person to die on the sidewalk. As for the elderly, they don’t receive government health insurance, as they do in the U.S. My friend told of a family that filled a suitcase with cash, and left it with their elderly mother. A cash-filled suitcase is the elderly person’s health insurance, and woe to those who don’t have such a suitcase. My friend told of a 68-year-old man who committed suicide because he couldn’t afford more treatment for his illness, and didn’t want to burden relatives with his hospital expenses. He had been a teacher with health insurance, but when he retired, he lacked insurance. In China, an elderly person who joined the Communist Party before 1949 (when the Communists took power) receives good treatment, at government expense. Those who have a government job, or a job with a big corporation, receive health insurance. But the majority of Chinese must scramble for health care, and are lucky to receive even mediocre care. The psychological cement that holds the disparate Taliban factions together is opposition to Tajik dominance in Kabul. Until the power of the [Tajiks] is curbed, no amount of American money or manpower will bring the insurgency to an end. So the challenge in Afghanistan, as in Iraq, is to overcome ethnic divisions, to involve all ethnic groups in the political process, to enable all ethic groups to feel that it’s their country and their government, and to let no ethnic group enjoy a monopoly of power. The old core of Sconset is made up of four short streets: Front, Broadway, Center, and Shell. The old houses are called “whale houses” because the original inhabitants practiced near-shore whaling (as the Native Americans did). These original inhabitants also fished for cod, etc. (as the original inhabitants of “Cape Cod” did). The original whale houses were simple, small, one-story rectangles, perhaps 10 feet by 14 feet. None of these simple rectangles remain — or rather, many of them remain, but not in their original form. 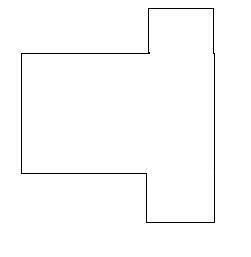 Later the inhabitants extended one end of the rectangle, to form a T-shaped house. 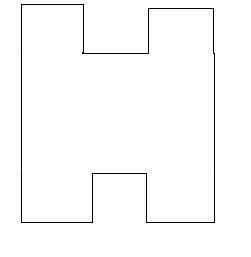 The first T-shape seemed to inspire a wave of imitation, and soon every rectangle had become a T-shape. Later still, the other side of the rectangle was extended, to form a double T (or perhaps I should say, to form a capital I). Several of these double T’s remain; one might say that this is the quintessential Sconset cottage. 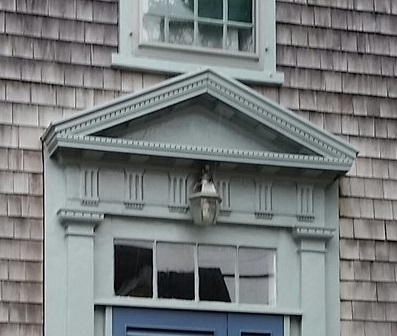 Small additions, called warts or flounders, were added by some homeowners, and 2nd stories appeared on some houses. In the late 1800s, Sconset became a popular tourist spot, and actors colony. A man named Edward Underhill built several cottages on the south side of Sconset (Lily Street, Evelyn Street, etc.). 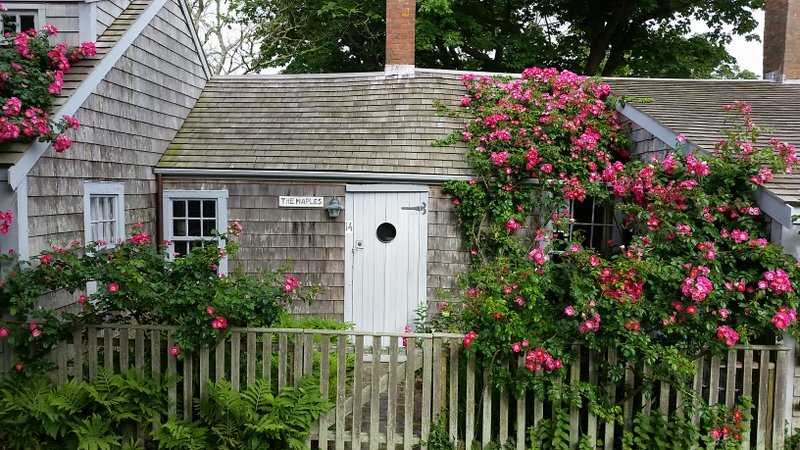 The Underhill cottages were modeled after the old whale houses — small, single-story, double T-shape. So after you’ve walked through the old core of Sconset, walk over to the Underhill section, and see how the old style was imitated. Isn’t culture about imitation, just as much as creation? Just as well-known as Sconset’s “old core” is Sconset’s Bluff Walk, which passes through numerous front yards, and offers a view of the ocean. One might compare the Bluff Walk to the longer Cliff Walk, in Newport, Rhode Island. 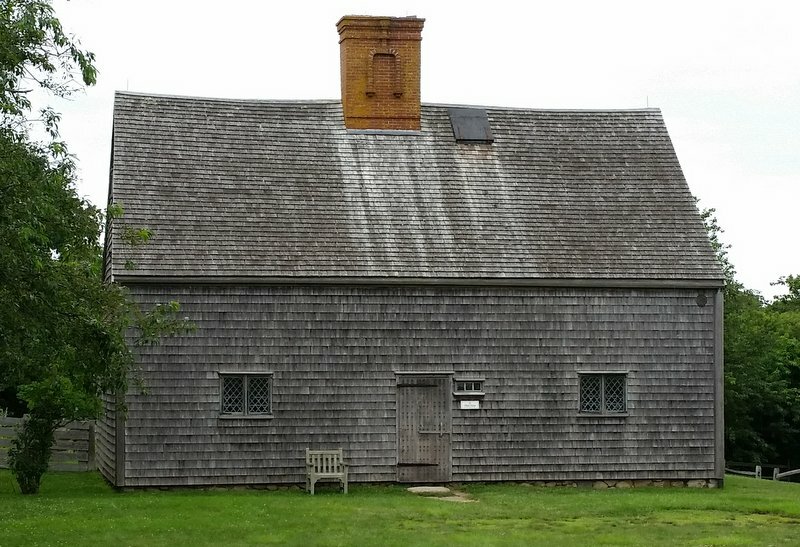 Nauticon Lodge at 4 Broadway, dated 1734. Note the “single T” shape. 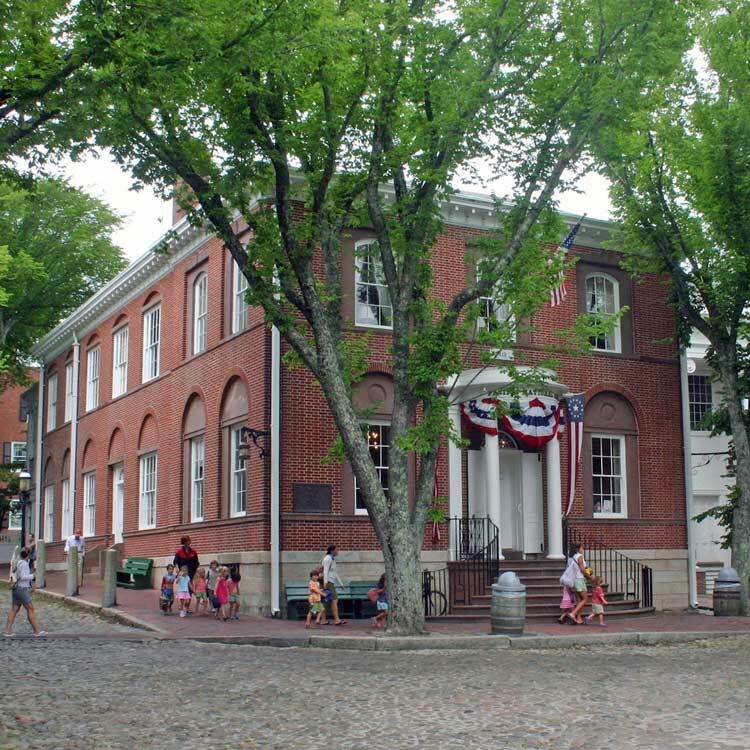 The Maples at 14 Broadway, built in the early 1700s. Note the “double T” shape. 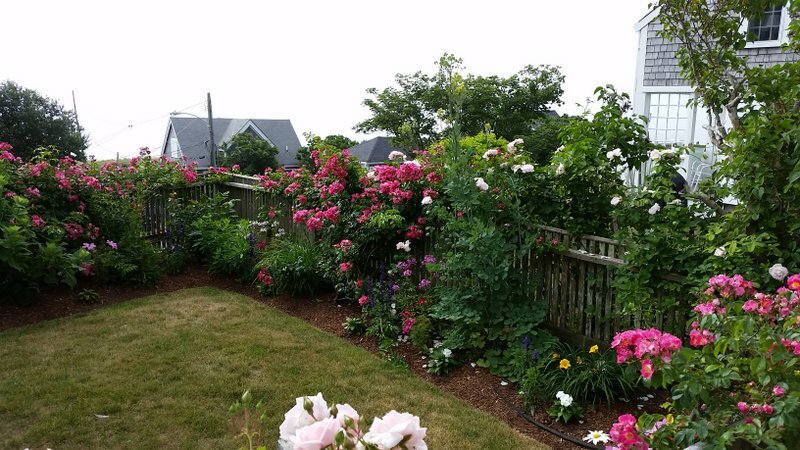 Sconset is known for its gardens and its roses. This route is an abbreviated Bluff Walk; the actual path extends further north. 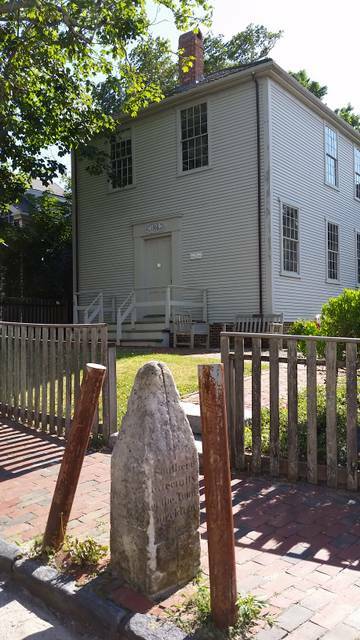 If you’re in downtown Nantucket, you may notice two white, obelisk-shaped stones about 75 yards apart — one on Fair Street, the other on Main Street. 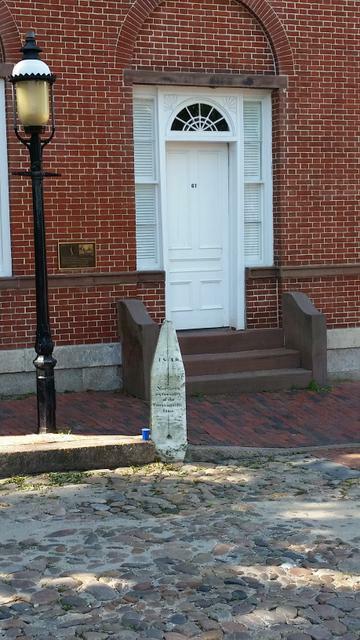 These are “meridian stones,” erected in 1840, probably by William Mitchell, who worked at the Pacific Bank nearby, lived with his family above the bank, and observed the stars from the roof of the bank. In 1847, Mitchell’s daughter, Maria, became world-famous when she discovered a comet from the roof of the bank. Like many Nantucketers at that time, the Mitchells were Quakers; they were related to Benjamin Franklin, whose mother, Abiah Folger, was born on Nantucket. with the Quaker meeting house in the background. The meeting house was built in 1838. A line between the meridian stones would be a north-south line, a meridian line, and it would allow a sea captain to measure the difference between true north and magnetic north. Magnetic north is the result of the attraction between the compass needle and molten iron in the core of the earth. Magnetic north changes from time to time and from place to place, perhaps because the molten iron inside the earth is moving around. with the Pacific Bank behind it, and cobblestones in front. 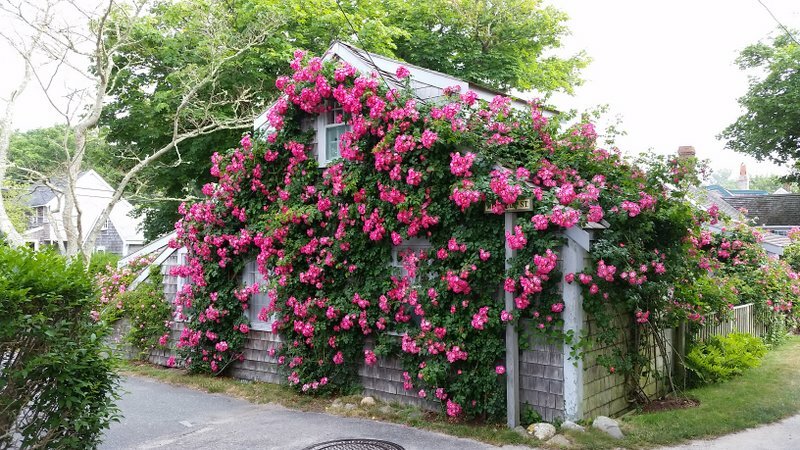 If you have energy left, you can explore the less-crowded periphery of town, perhaps with the help of one of the self-guided tours developed by the Nantucket Preservation Trust. Or take one of the many guided tours (there are ghost tours, architecture tours, history tours, bird-watching tours, etc., just ask at Tourist Information, or check the newspaper). Many tours are led by Bill Jamieson (508-332-0953). Here’s a route that takes you from the center of town to the old windmill — a 2-mile circle. The circle begins and ends at the Pacific Bank, which is at the intersection of Main Street and Center Street. If you’re driving, you may want to park at the windmill, and start the circle from there. From the Pacific Bank, walk up Orange Street. Just before the Unitarian Church, turn right on a path to Fair Street. Once on Fair, take Ray’s Court to Main. Turn left on Main to Pleasant Street, then right on Candle House Lane (just past Moor’s End brick mansion). 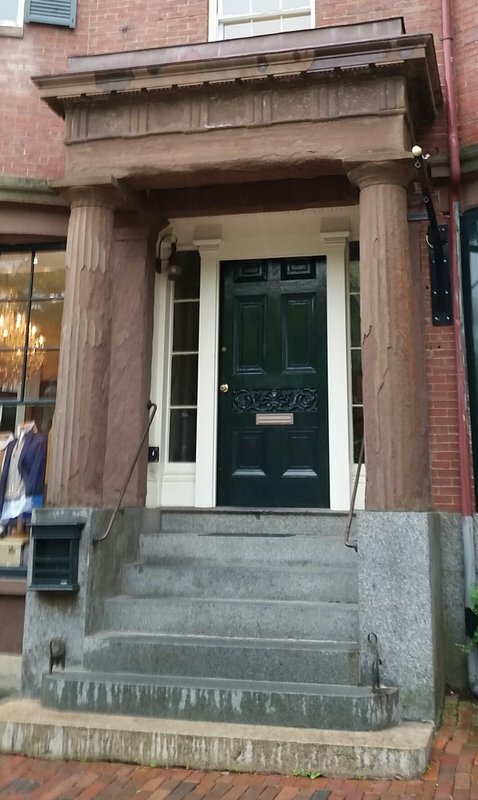 Walk down Candle House, then turn left and take dirt road (North Mill Street) to Prospect Street. Cross Prospect and enter Mill Park. Take dirt road on left (don't take first left, which is just a path, take second left, a dirt road). With luck, you’ll find old African-American cemetery. When dirt road brings you back to Prospect, turn left on Prospect, then cross to windmill and take South Mill back to Pleasant. Turn right on Pleasant then immediately left on Lyon. At Pine, turn left to Darling. Go right on Darling then left on Fair, which will bring you back to Main. 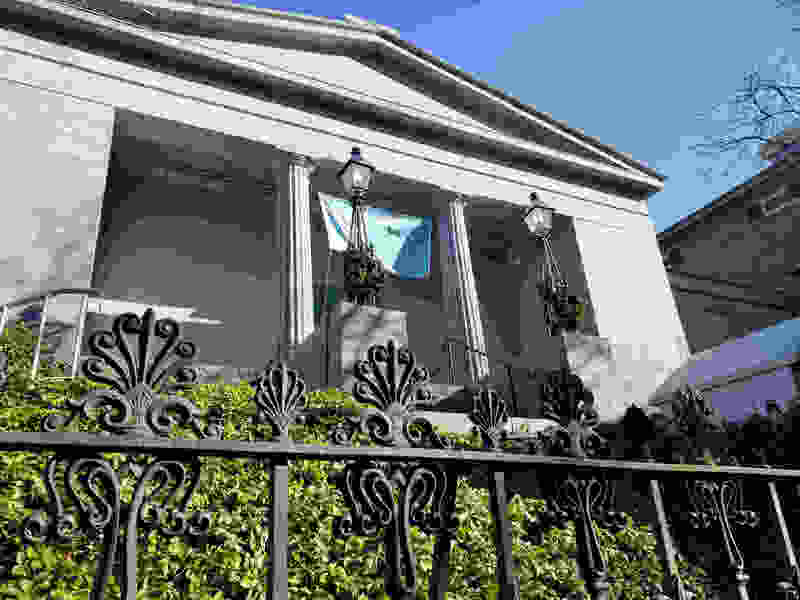 The Pacific Bank, built about 1818. Ray’s Court is a quiet, shady, unpaved street. 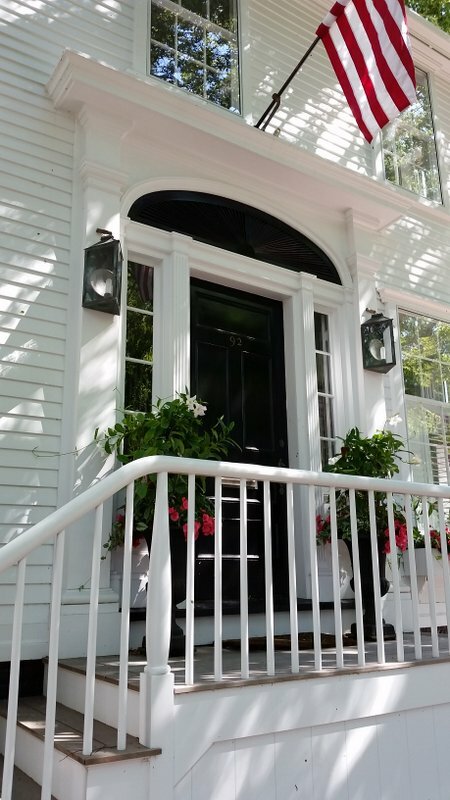 Note the elliptical fan over the door. 1 Pleasant Street, built 1837. 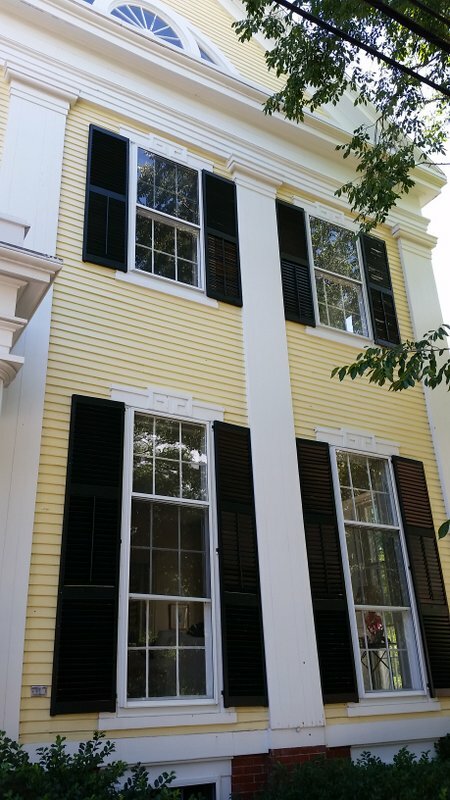 Note the Greek key designs over each window. Nantucket’s first brick house, built 1829. 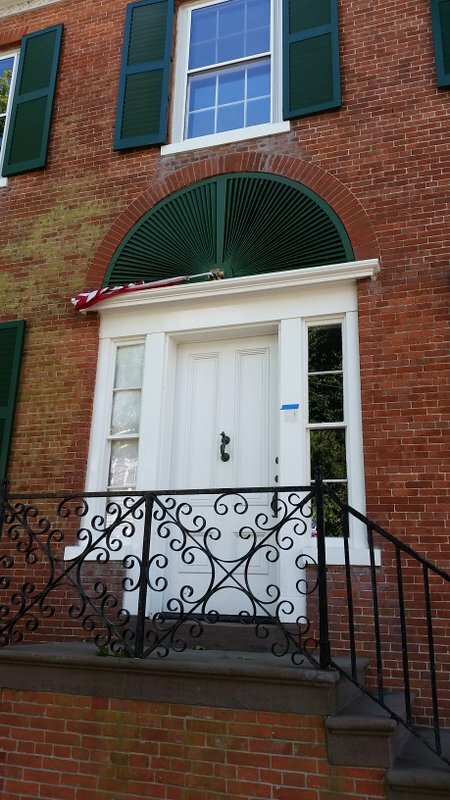 Note the semi-circular fan over the door. Here’s a route that takes you from the center of town through two parks, then back to the starting point. 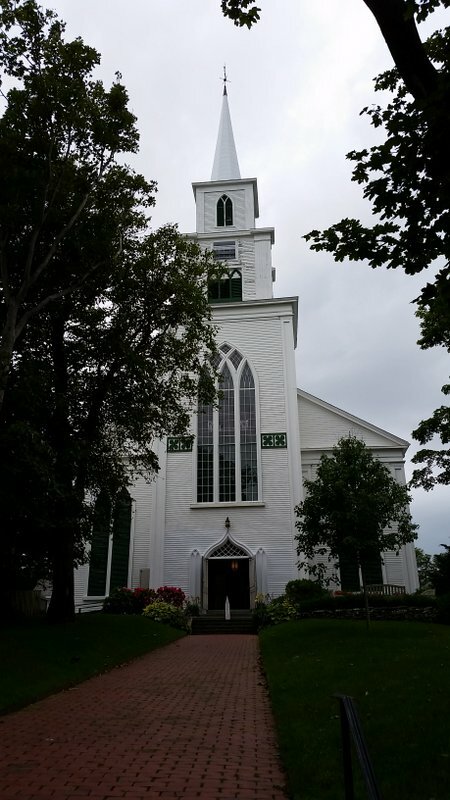 It’s only 1.6 miles, but it has some interesting sights, like the Oldest House and the North Church (also called the First Congregational Church). Like the Windmill Loop, this route begins and ends at the Pacific Bank. If you’re driving, you may want to park at Lily Pond Park, and start the walk from there. 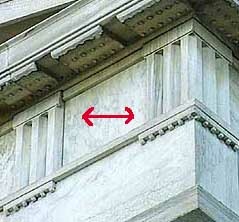 and the triglyph pattern between the pediment and the transom. 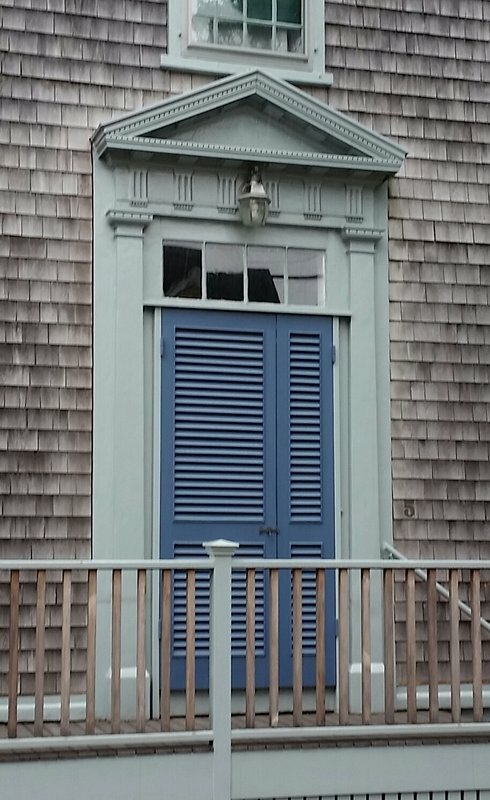 North Church is one of the most conspicuous buildings on the island. and the smallest windows, and the diamond-shape window panes. This circular route is 2.5 miles long. Near the corner of Pawguvet Lane and Hulbert Ave., there are two small lighthouses called Bug Lights; they were built in 1838. Perhaps a ship captain could align the lights from these lighthouses to create a “line” into the harbor. A tourist on Nantucket might also want to visit Altar Rock, which is reached via a dirt road off the Polpis Road. Altar Rock is one of the highest points on Nantucket, and it gives you a good view of the island. It also introduces you to Nantucket’s “empty center” — the moors, the dirt roads, etc. — a good area for mountain-bikers, joggers, and walkers. Another high point on the island, with a good view, is the steeple of the North Church. Pay a small fee, then climb the 94 steps. 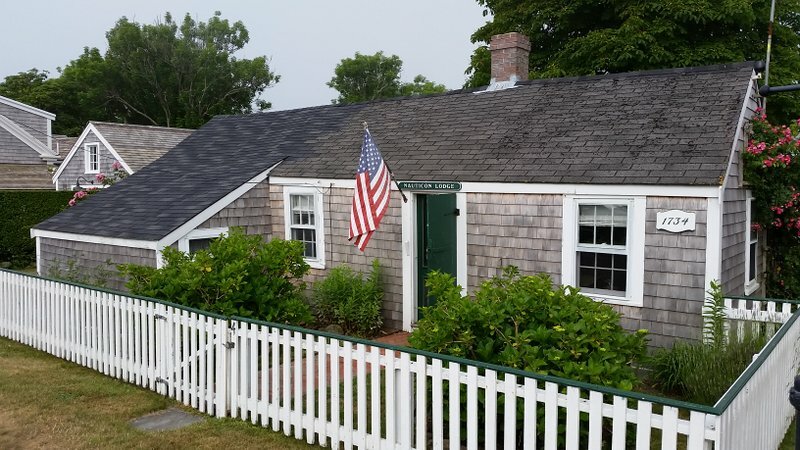 If you want to walk through the moors, visit the Sanford Farm property off Madaket Road (1.5 miles from the junction of Madaket Road and Quaker Road, on the left side of the street); the property is owned by the Nantucket Conservation Foundation. 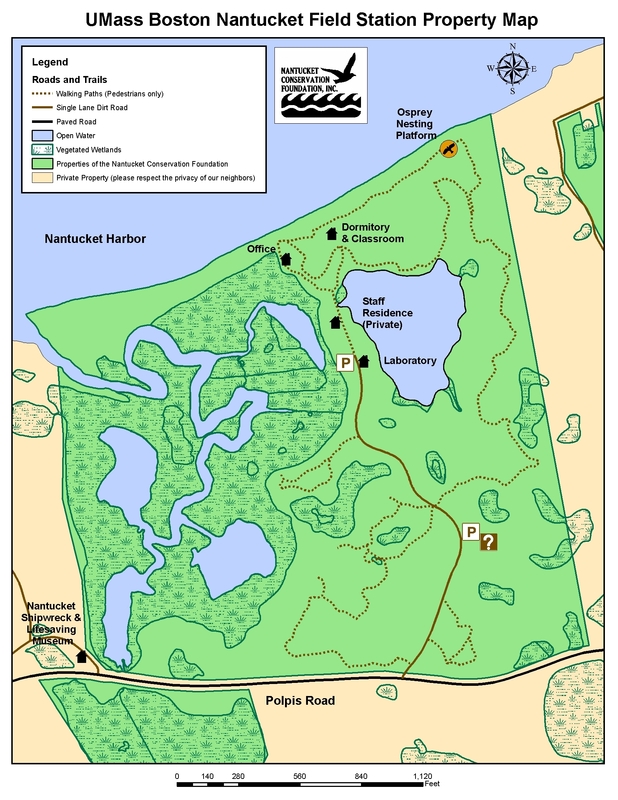 A 3-mile trail goes along Hummock Pond to the beach (near Cisco); there are also shorter loops. The flat country offers broad vistas, a big sky, and soaring hawks. The trail is well marked, with signs describing the history and ecology of the area. When the trail reaches the beach, you can turn left (east) and walk along the beach for 5 or 6 miles to Miacomet Pond, or to Surfside; or you can turn right (west) and walk a shorter distance to Madaket. Another country walk, somewhat shorter, is Tupancy Links (click here for map). While the Sanford Farm trail goes to the south shore, Tupancy goes to the north shore, and offers a view of Jetties Beach, etc. 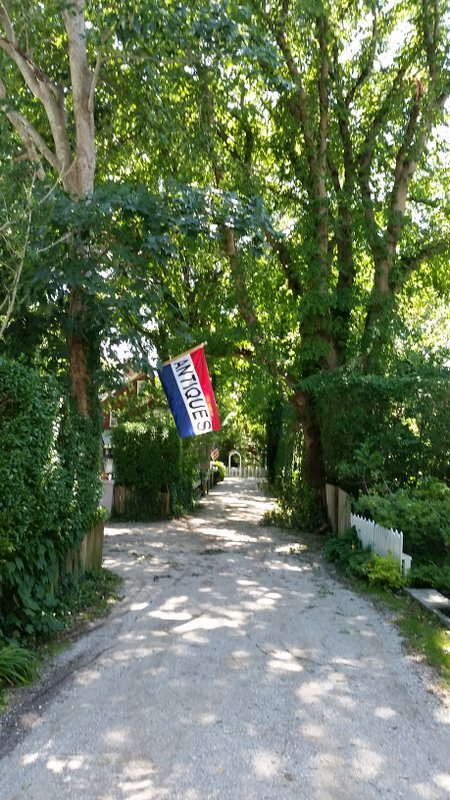 I recommend a self-guided tour of Nantucket’s trees. It’s a rather long tour; you may want to do it over two days. It takes you through some interesting neighborhoods, and teaches tree-identification. Click here for guide. UMass has a Field Station on Nantucket, which is open to the public, and has trails through the undergrowth; the land isn’t as open as Sanford Farm and Tupancy Links, you can’t see as far. The Field Station offers guided walks, suitable for youngsters. It’s on the north shore, off Polpis Road. It has a cliff with a view of the inner harbor. Click here for a trail map. Everything is expensive on Nantucket. Perhaps the most affordable lodgings are at the Youth Hostel at Surfside. The Hostel is in a handsome old building, once a LifeSaving station (CoastGuard station); the building is similar to the LifeSaving station (now a LifeSaving museum) on Polpis Road. The architecture is probably Carpenter Gothic. I recommend a film by Ric Burns called Nantucket (2011). It’s about one hour long, has great images of the island, and summarizes the island’s history. My only complaint is that the writing is too poetic, too flowery. The film isn’t easy to borrow, but it can be purchased from the Nantucket Historical Association. 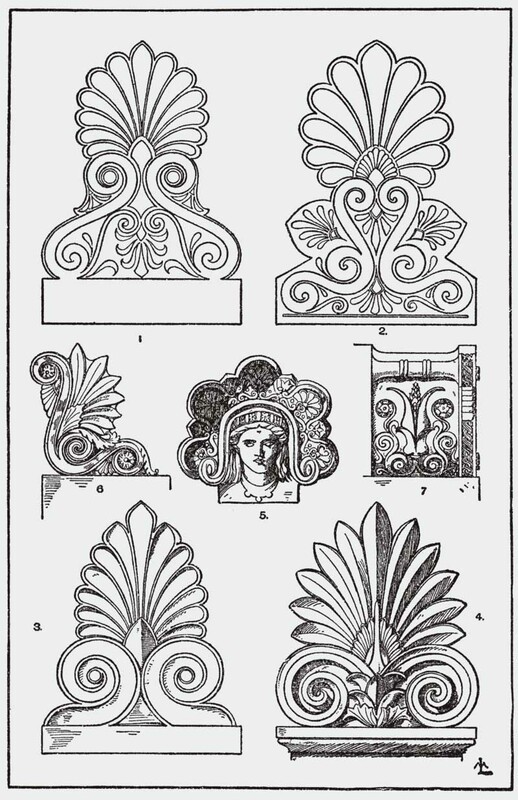 Palmette Ornament that resembles fan-shaped leaves of a palm tree. Also called honeysuckle or anthemion. 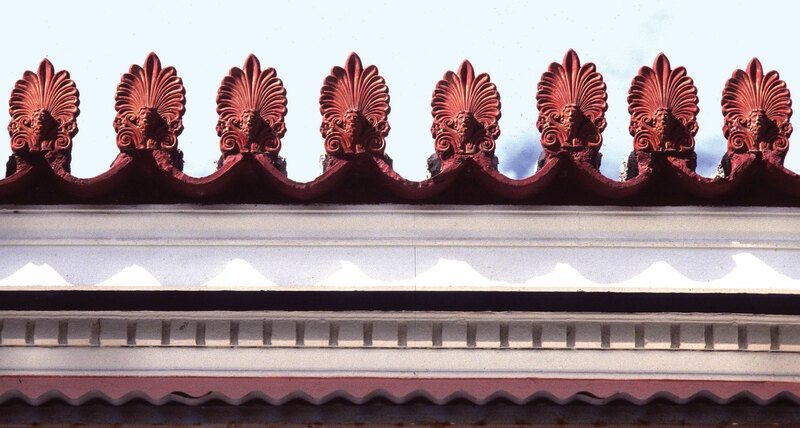 The palmette is often found on a roof line, where it’s called an antefix. 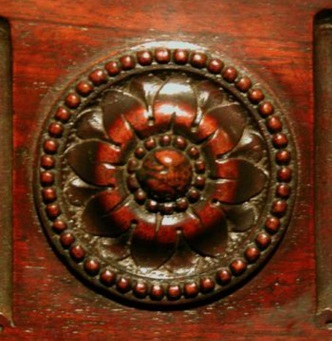 Patera Round classical ornament, often seen in the corner of doorways, derived from a shallow bowl (“patera” is Latin for “bowl”). Triglyph From the Greek word for “triple groove.” Pronounced “TRY glif.” One of the most common classical ornaments. Dates back to ancient Greece. 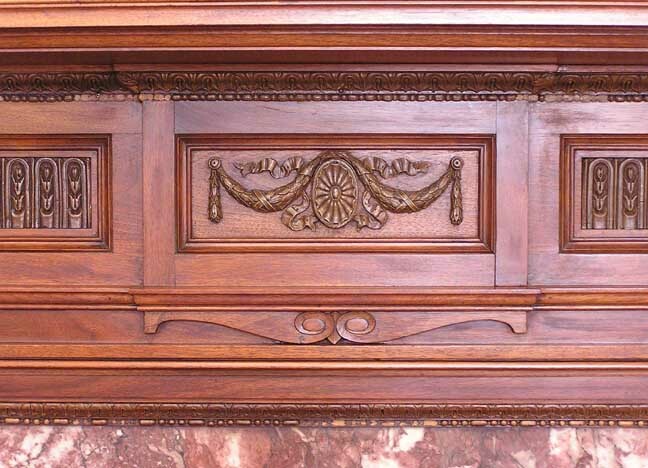 Originally the triglyph was an imitation of a feature of older wooden buildings, an imitation of the notches on beam ends. 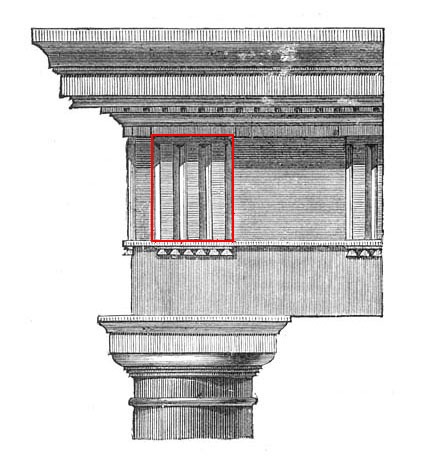 In the doorway below, the triglyphs are between the pediment and the transom (also known as “transom window” or “transom light”).